One word to sum it up: Emotional. Movies about the Iraq war have become about as popular as Jennifer Aniston romantic comedies in Hollywood these days. 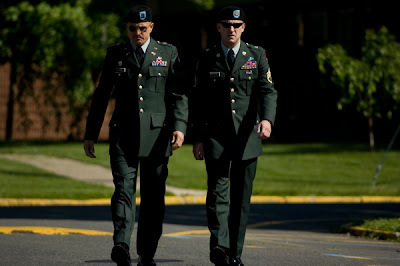 One of them, The Hurt Locker, even won Best Picture at the Oscars in 2010 over the highest grossing movie of all time. However, this movie wasn't the only one tackling the Iraq war as a topic at the Oscars in 2010. The Messenger was nominated for two Oscars: Best Supporting Actor (Woody Harrelson) and Best Original Screenplay (which it lost to The Hurt Locker). The most amazing thing is that it has taken this long to get to our shores, only to wind up as a straight to DVD release. Which is a shame, because this movie is truly amazing, no doubt about it. 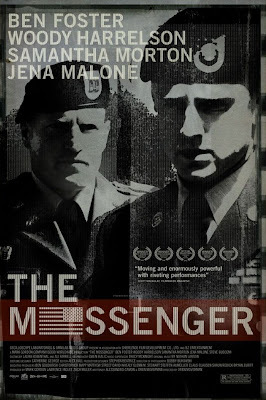 Instead of focusing on the actual war going on, The Messenger follows the people who go around telling families that their son/relative has died in Iraq as a consequence of war. US Army Staff Sergeant Will Montgomery (Ben Foster) is sent back home after he is injured by an improvised explosive device. He is upset when he gets the job of being in the 'Casual Notification Team', because he hasn't had much experience in counselling or grief management, so he doesn't know how suited he is to the job. He is paired with Captain Tony Stone (Woody Harrelson), who has been doing the job for much longer, and teaches Will a thing or two about what they are doing. One case which takes Will by surprise is that of Olivia Pitterson (Samantha Morton), who also has a young child. He is taken by her, even though it may not be in either of their best interests to start a relationship. The Messenger took me completely by surprise. I thought it would be just another war film with all these explosives and espionage and that kind of thing, but it wasn't. It handles such a dark topic, but yet it is still completely engrossing and emotionally powerful. It deals with all type of grief, but yet, it isn't as depressing as it may have you believe, and has a good deal of humour spread throughout it. It's deftly handled by writer/director Oren Moverman, who was also the brains behind the brilliant screenplay for I'm Not There. He clearly knows his agenda: to make a movie about such a timely matter which also has a nice romantic story which is nicely, if slightly ambiguously rounded off in the end. The way the characters are developed is a high point. This is particularly seen in Will's monologue towards the end, which is so beautifully done. The performances, however, are the best reason to see this movie. Ben Foster does a stunningly good turn in the lead role, and is slowly building up to be one of the future's finest actors. He gives the character the right amount of mysteriousness, and did remind me of the 'war is my drug' character James in The Hurt Locker. Samantha Morton is sweet and realistic as the love interest who was charming to watch. Jena Malone, in a small role, makes the most of her opportunity and shows that she is ready for bigger things now, like the upcoming Sucker Punch. Steve Buscemi, also in a small role, is brilliant as always. 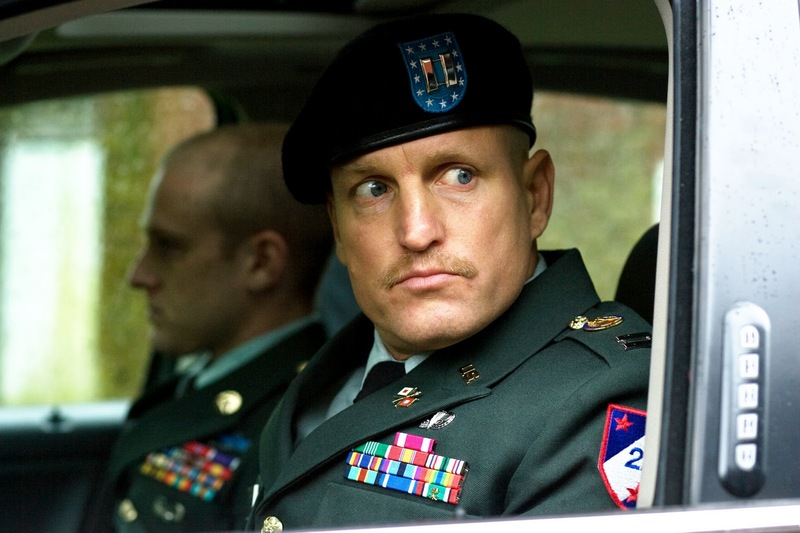 It is really Woody Harrelson who steals the show though, in his Oscar nominated performance. His turn as a recovering alcoholic with an incredible attitude towards grief was brilliant to watch. The strength he had over everyone was obvious. Yet, he could still lighten things up with some trademark Woody humour. THE VERDICT: A well performed, well written movie tending to an issue which is both depressing and interesting to watch, but never failed to blow me away. I really quite enjoyed The Messenger. Ben Foster and Woody Harrelson are both great and the movie manages to give a different perspective on the war in the Middle East without sounding preachy or full of hindsight. Jack - You simply must watch it! It was cool. Thanks! Castor - That's what I thought, too. It was a tremendous movie. And I feel special because you commented on here! You're like, movie blogger famous!